In windows command prompt, Just move to that particular directory and check the screen shot which help you to understand what I mean here. Now we need to initiate a Node.js project by invoking a command called “npm init”. While invoking this command will ask you to enter application name, description, version, and other details. For more information please check my screen shot. The above command finally will create package.json file which basically used for defining our application specific dependencies and other details. We can edit this file at any point of time and if you define any new dependencies then will have to invoke “npm install” command for installing those new dependencies. Now we need to edit the package.json file for defining our grunt dependencies. The modified package.json file contents are given below. 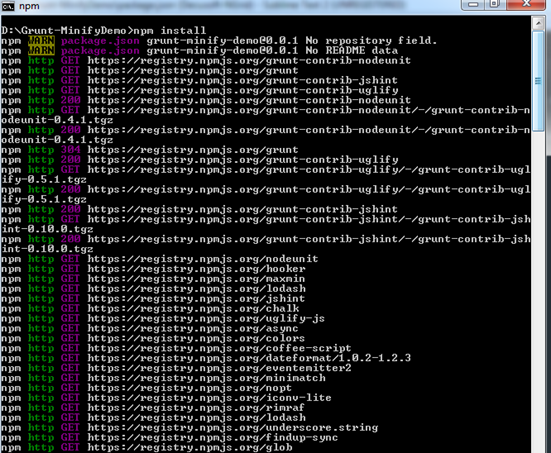 I have included grunt specific dependencies and changed main value as “Gruntfile.js”. This is an entry point of the application. Now just invoke a command called “npm install” for downloading those specified dependencies as we discussed in step number 7. The above command will download all the dependencies and for verification just check node_modules folder present in out application folder “D:\Grunt-MinifyDemo”. 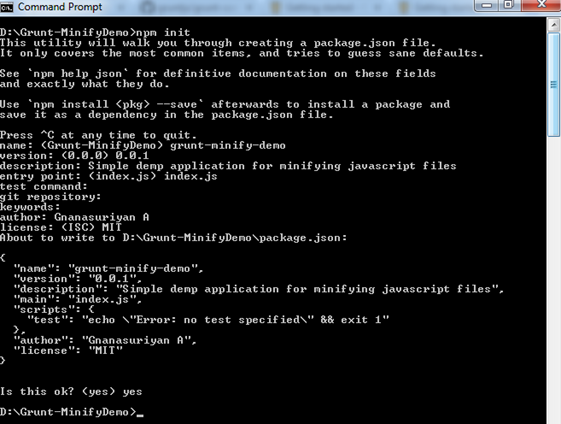 Now I am going to write a grunt task for combining/minifying my File1.js and File2.js file present in src folder. The source code which I have written in Gruntfile.js for minification is given below. The line grunt.loadNpmTasks function is basically used for loading grunt modules and grunt.registertask is basically used for registering grunt tasks. In single project we can register more then one grunt tasks. For more information about registering grunt tasks, please refer "http://gruntjs.com/creating-tasks". Instead of you can run the above task by triggering a command “grunt uglify:dev”. In some situation we need to run some more tasks before running actual minification. For example normally we will have to clean the existing result before taking a new build. The grunt actually provide a way for defining more than one tasks which will run sequentially. Just check my production task which I have registered in Gruntfile.js. I am just cleaning all existing builds before taking a new production build. Now just invoke same “grunt prod” command and see the result. We are getting some warning because not loading grunt clean module properly. Just load that grunt clean module properly and test it. 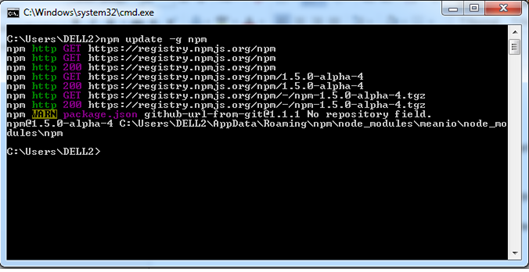 For loading clean module, we need to update package.json file and need to invoke “npm install” command. This is my modified package.json file. Now we need to load a “grunt-contrib-clean” module by using “grunt.loadNpmTasks“ function and my modified Gruntfile.js source code is given below. 1. 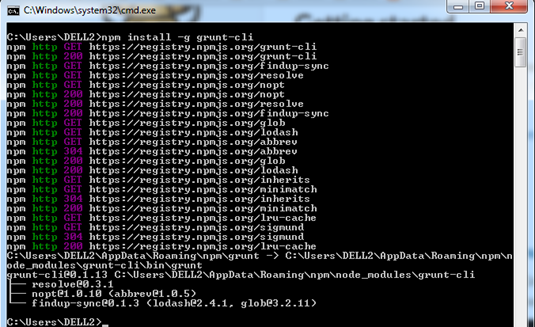 We have created new Node.js application for running grunt tasks. 3. We have included clean task for removing existing build from file system by using grunt clean module. The entire project is available in my github repository (https://github.com/gnanasuriyan/grunt-minification ). Hi, there is a little mistake in your final grunt file, comments are removed when dev task is executed. In order to fix it, switch preserveComments option between dev and prod task. Anyway really useful tutorial, thx!